Life Style Support to identify your values and the gift of your soul. 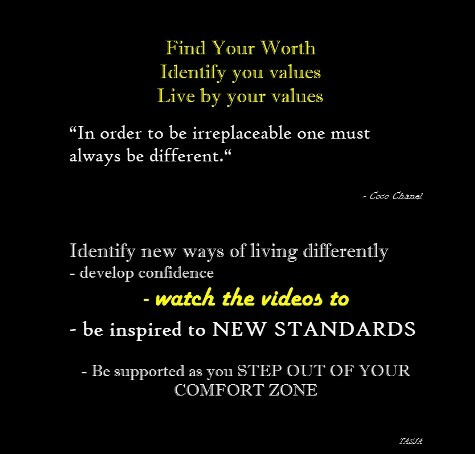 Living these new values and integrating them into the world around us. Living in present moment is ability to free yourself from the familiar. Identify with What's more important to you today? "Becoming one with your soul and expressing it in the world is the fundamental foundation of life style support activity." People in the public eye are most vulnerable in transition stages. This is where life style support is most valuable. Self awareness can itself become a trap. It's not about revisiting and reworking and rehashing and recycling this so called self awareness. Recycling self awareness practices takes a lot of energy away from what is really important. What we do is take you to what is beyond that. To live a purpose driven life. Getting fear energy out of the way. Allow new feelings to flow like waves of the ocean. That can be a challenge. We cannot hang tightly to what we know - we need to shift into a new paradigm. To move from what you feel to a place of relating to life and thoughts differently. When these Tremendous energies of awakening begin to well up, this can become a personal challenge. "Life Style Support helps you master your new feelings and finding your true self." Who you really are without getting lost in the explosions and flows of new capabilities and self worth. When he read our Tantra site, he was compelled to call and share his personal experience that absolutely saved his hand. Pete was told that was the only way. If he believed the first opinion then he would have no hand. We are encouraged through his personal experience to always do our research and rarely should we just believe blindly that we only have one option. The value of a second opinion is critical as Pete shares this story in his video below. Whenhe read our Tantra site, he was compelled to call and share his personal experience that absolutely saved his hand. Pete's surgeon declared him that there was no other option according to his surgeons 26years of medical practice. How often do we hear that? You be that judge after watching and listening to Pete's experience. "When our body is out of balance, our hormones our emotions suffer. These imbalances would slow down or even block spiritual progress." When our sexual energy is out of balance or disconnected our ability to make healthy life choices are impaired because we feel stuck. Our service is one on one, no group or shared facilities unless your choose to attend one of our events. All events are also available to you privately. Many have experienced trauma, relationship difficulties and pain that remains unexplored, hidden. We provide the essential privacy for the spirit to feel the trust. Our approach is holistic embracing and inclusive of all areas of life. Your privacy and peace of mine is guaranteed. The testimonials and stories have been amended to protect client privacy. These people choose to share their experiences so you can have a sense of the range of experiences available to you. Is our approach all about therapy. No, life goes beyond therapy. We continue working on the content to provide you with greater understanding of our bodies. Please call us for personalised appointment tailored to your current and future needs. Taking relationship with your own body to another level.